In perhops Miro's most celebrated work, The Farm, a Catalan landscape from 1921 to 1922, the artist moved away from the soft lyricism of his earlier landscapes and began incorporating symbols such as squares and circles to emphasize key aspects of the work and which were derivative of Francis Picabia's (1879-1953) 'machine' aesthetic. 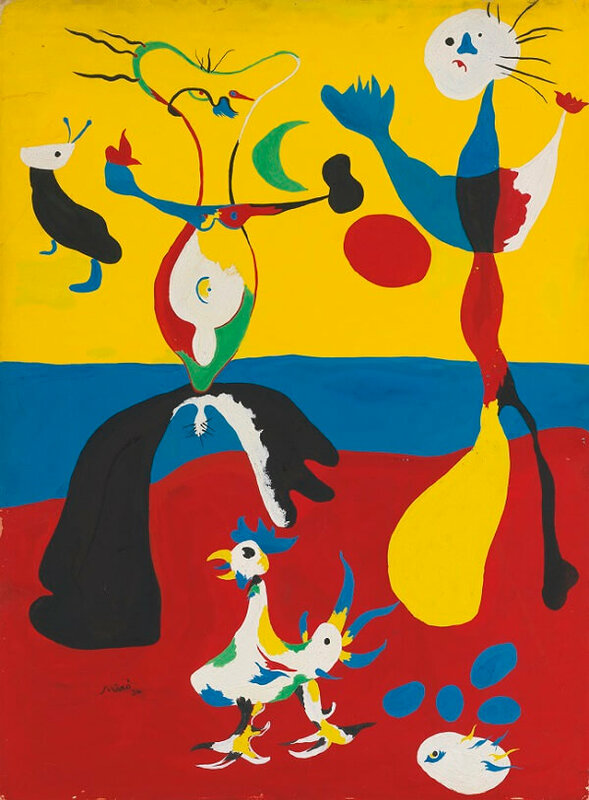 In a subsequent work, The Tilled Field, Miro made a further move away from pure representation by incorporating signs and colours in the work that made the work more sensuous than cerebral. The Catalan landscape with its red soil is still an integral part of the work, but the inclusion of a number of apparently disparate objects requires the viewer to analyse the work. The incorporation of a large ear and eye together with French and Catalan motifs suggests his awareness of the duality of his life both personally and as an artist, not just anecdotally but sensually. Le Fermier et son epouse is yet another development of the theme of a Catalan landscape in which the red soil is depicted in the foreground and the sea in the background. The yellow sky, acting as a complementary colour to the blue, imbues the picture with a sense of the heat. There is now no attempt to show illusionistic space and the work is completely devoid of anecdote.